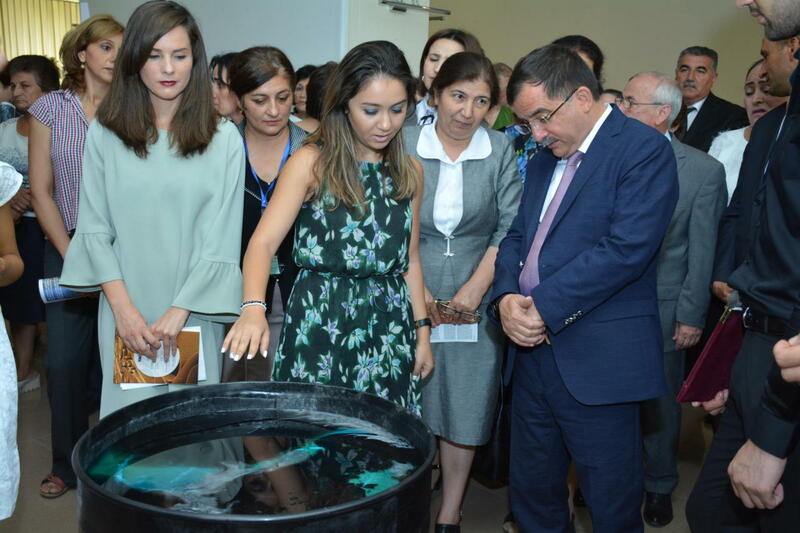 A traveling exhibition "YENƏ O BAĞ OLAYDI" (ONCE AGAIN THAT GARDEN BE) has opened in Gazakh region. 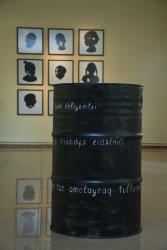 YARAT Contemporary Art Centre presents a traveling exhibition with works by renowned Italian artist Michelangelo Pistoletto and emerging local artists. The exhibition is the result of a workshop given by CITTADELLARTE Fondazione Pistoletto (Biella Italy) director Paolo Naldini discussing the theory of the “Third Paradise” developed by Michelangelo Pistoletto. The theory wants to overcome the current worldwide existing conflict between the two polarities of nature and artifice, it aims to create a new humanity with a responsibility for the own environment in harmony between technology and nature. The exhibition starts with Michelangelo Pistoletto’s labyrinth that leads visitors through a maze in search of their own self. The form of a labyrinth has long been used as a metaphor for discovery and personal journey. The journey brings the visitor to the “Third Paradise” sign that is built with regional sweets for generations produced in a sustainable way. The symbol represents a reconfiguration of the mathematical infinity sign with three circles. The two opposite circles signify nature and artifice; the middle part represents the generative womb of a new humanity based on harmony. 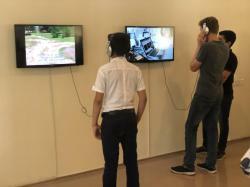 The artist Etibar Ismayilov creates a wishing well with an instruction in encrypted language how to use it. The text method’s refer to the fascinating capacity of human’s brain and embodies the artist’s encouragement to continue believing in the impossible. 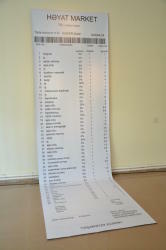 Gunay Aliyeva's work looks at an artist’s life in the form of a receipt inspired by the words of Joseph Brodsky "our products speak about us rather than our confessions”. 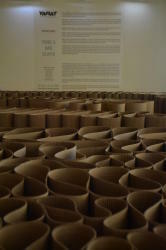 Mousa Beyzade uses the democratic technique of paper cut to approach the idea of the “Third Paradise”. It shows how health technology has become an integral part of us, proving how a harmonious relationship between man and technology, the natural and the artificial, can emerge. Timely, interdisciplinary, simultaneously Nazrin Mammdova’s work exists at the intersection of technology, design and nature. Pre-recorded sound ambiences were put back in their original surrounding, re-echoing and resonating with the mountains, re-creating a dense sound impression with multi-layered textures, rhythms and frequencies. Vusala Agharazieva’s purpose of her work is to show the importance of a harmonic and reasonable relationship towards high-tech features, which make on one hand our life convenient on the other hand we still should not forget to appreciate the gifts of nature. 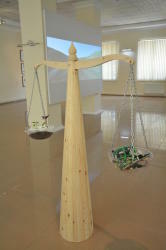 Her balance visualizes this concept consisting on one side of micro electronic devices in one scale-pan and soil on the other. Leyli Gafarova’s multimedia project “Ghilman” (Farsi: paradisiacal, beautiful, young beardless males) documents the annually recurring Novruz tradition in Gazakh, when men dress like women for the celebration that symbolizes fertility and new beginnings in early spring. 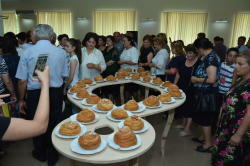 The artist is interested in paradox Azerbaijani society phenomena that question a bi-polar understanding of gender. 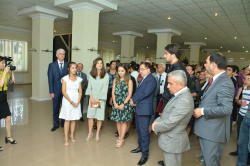 Organizational support is provided by Azerbaijan State Art Gallery of the Ministry of Culture of the Republic of Azerbaijan. 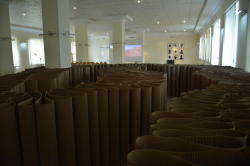 The exhibition will run until October 28.